As my time blogging goes on, I’ve become more adamant about testing each recipe to make sure it’s perfect. That backfired a little when I was forced (forced, I tell you!) to make variations on this recipe at least six times in the past couple of months. My husband and friends ate so many chocolately banana muffins in search of the Right One. I’m about to tell you all about it. Ready? There are two versions of this. One is the Naked Muffin–I can’t call them plain. They have all the best parts of banana bread, plus two secret ingredients: bourbon and walnuts. The funny thing is that I don’t like walnuts. They appear in the original recipe, but I resisted because nuts are usually optional and I cannot stand that weird bitterness that walnuts have. After version 4 or so, I conceded that something was missing, and that it was probably the nuts. I won, though, because I figured out that they could be ground up, which produced a subtle depth and improved texture but without any Walnut Surprise chunks. I also tested them with pecans, which worked equally well. The second version is the Amped Up version: the Naked Muffin plus a drizzle of Maple Bourbon Glaze. It makes them sweeter (and it does charge the muffins with straight bourbon, so don’t give this version to any kids). It’s not super visible on the finished muffins because the bourbon makes the glaze the same color as the muffin tops. You could get a thicker glaze, more like icing, by adding additional powdered sugar, if you don’t mind them being super sweet. If you like nuts, chop your nuts into small chunks. If you don’t, grind them into dust. If you’re allergic, leave them out altogether. If you don’t have lemon juice, substitute 1/2 teaspoon white vinegar. To turn this back into banana bread, lower the heat to 350F and increase the cook time to 45-50 minutes. For a more icing-like look, increase powdered sugar to 1 cup. Bourbon! 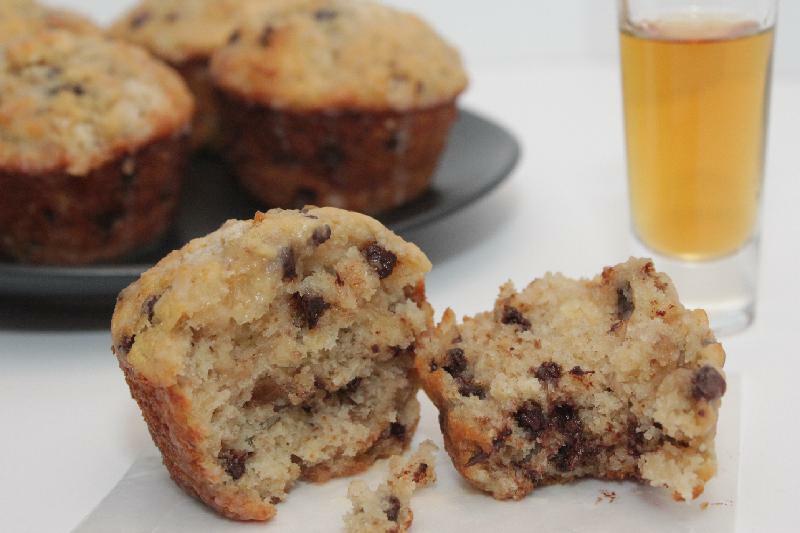 A little smooth sipping bourbon next to one of these warm, chocolatey muffins? Oh yes. If adding more alcohol isn’t what you’re looking for, I like these with a glass of cold milk. Adapted slightly from a recipe in the Joy the Baker Cookbook, although I got it by way of one of the many blogs that has posted it. I changed this from a bread to a muffin recipe with the help of this article. 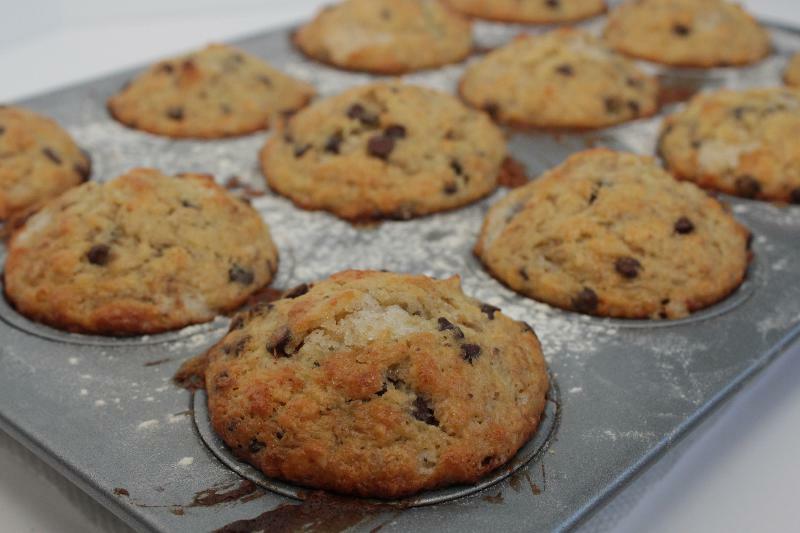 For a healthier version, try these fiber-rich, un-spiked muffins. Bourbon-Spiked Banana Chocolate Muffins! Bananas, chocolate, and just enough bourbon come together in a snack, breakfast, or dessert recipe. Preheat oven to 375F. Grease and flour a muffin tin. Sift or whisk together flour, baking powder, and salt. Set aside. Cream butter and sugar together until light and fluffy, about 3 minutes in a stand mixer. Add eggs one at a time, beating about 1 minute after each. Scrape down the sides and add bananas, lemon juice, and bourbon. Beat until well mixed (it will continue to look slightly separated; that’s okay). Add dry ingredients all at once, mixing until it’s ALMOST completely incorporated. Stir in chocolate and nuts. 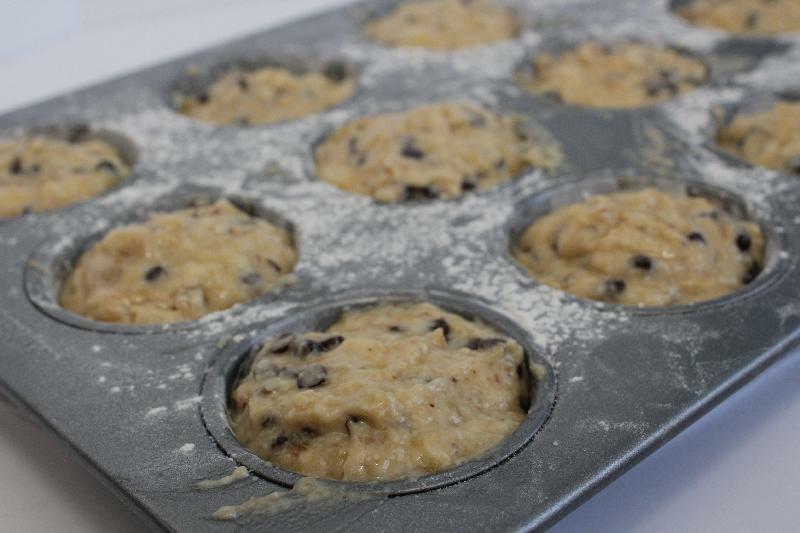 Use a large ice cream scoop, if you have one, to fill the muffin tins. If you don’t, use a spoon or spatula to gently shape the tops into a dome. The tins will be almost full. Bake 16-22 minutes, or until tops are brown and a toothpick comes out clean. Allow to cool in the pan for 5 minutes before turning out onto a wire rack to cool. Whisk ingredients together. When muffins are completely cool, drizzle glaze over muffin tops.